If you do not have credit for BC high school Physics 12 or equivalent, you must take PHYS 100. 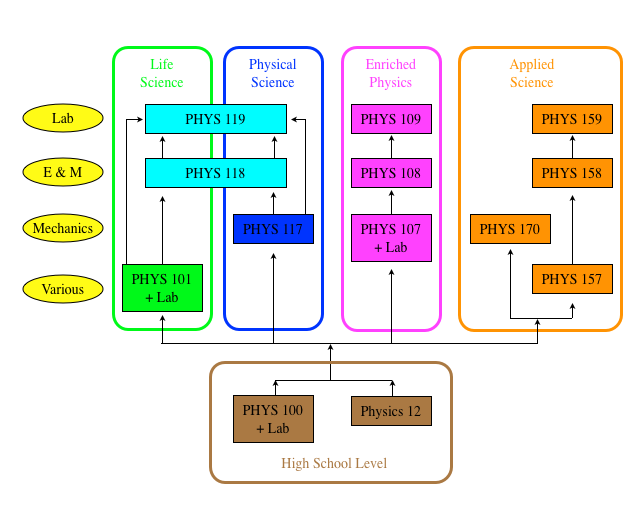 This is required by Faculty of Science, even though PHYS 100 is not listed in any degree specializations. Life science students normally take PHYS 101. Because many medical schools require two university physics courses, many life science students take additional physics courses. PHYS 102 has been replaced by PHYS 118, and the PHYS 119 lab (they both are also offered in the summer). Most physical science students take PHYS 117, PHYS 118, and the PHYS 119 lab. Students not pursuing physical science degree can also take PHYS 117, PHYS 118 and PHYS 119 lab. Students with good marks in high school physics and math may take the enriched sequence PHYS 107, PHYS 108, and the PHYS 109 lab instead. Students with questions/concerns may contact Prof. Janis McKenna at janis@physics.ubc.ca. Life Science degrees accept PHYS 107 or 117 as well as PHYS 101. PHYS 157/158/159/170 are generally for Applied Science students and registration is mostly by Standard Time Tables (STT). Consider taking ASTR 101 or ASTR 102, to help satisfy the Faculty of Science requirement of two courses with lab components, and the requirement of a biology or natural-science course (You must still take an actual BIOL course if you don't have credit for high school Biology 11 or 12). The above mentioned courses can be found on UBC Course Schedule website. Note for students starting a science degree program at UBC in 2019 there will be new breadth requirements for graduation. See details here. The arrows indicate only the most common paths through the courses. Consult the First Year Physics Advisor about other possibilities. Planning to enter a Physics & Astronomy specialization? For various Physics and Astronomy specializations and how to apply info, please consult Degree Program page.